FLCC National Championships will be televised on Fox Sports Net. Check local listings. Book your flight with Jet Blue! 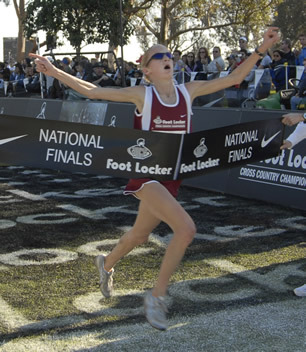 Kathy Kroeger of Franklin, Tenn., and Chad Hall of Big Bear Lake, Calif., won the Foot Locker Cross Country Championships (FLCCC) National Finals at Morley Field in Balboa Park in San Diego, Calif. Kroeger pulled away from South Regional champ Aurora Scott with 800m to go to win in 17:29. 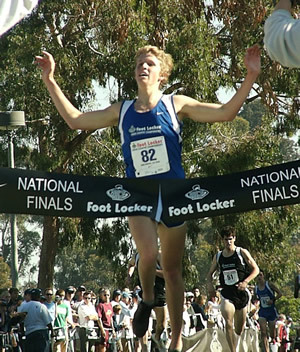 The boys race which saw several lead changes wasn't decided until the final 150 meters when Hall kicked to win in 15:20. Click on an athlete to see a bio and pictures. Pictures & video will be continuously added. Alabama, Arkansas, Florida, Georgia, Kentucky, Louisiana, Mississippi, N. Carolina, Oklahoma, Puerto Rico, S. Carolina, Tennessee, Texas, Virginia, West Virginia, U.S. Virgin Islands, U.S. Overseas Military Installations. Colorado, Illinois, Indiana, Iowa, Kansas, Michigan, Minnesota, Missouri, Nebraska, North Dakota, Ohio, South Dakota, Wisconsin, and U.S. Overseas Military Installations.